These examples of original art by JQ fans are dedicated to Doug Wildey, 1922-1994, the man behind the phenomenon that is Jonny Quest. It was Mr. Wildey who, at the request of Hanna-Barbera in the early 1960's, developed the character, look and overall atmosphere of the animated adventures of Jonny that were first broadcast in 1964. It is with deep respect for the quality work produced by this man and his talented team that this site presents art by fans of Jonny Quest. We hope you enjoy it! Unless otherwise noted, all images on this page are © by the artist. Tina Schmidt is an artist who specializes in art using a style reminiscent of the so-called "modern" art seen in the mid-20th century. The artwork shown here (which seems to be based on Mystery of the Lixard Men) was done for someone who won an auction in which the prize was art with an animation theme. Schmidt can be contacted on her website at: www.midcenturyplanet.com in case anyone wishes to purchase or commission any JQ (or other) art. 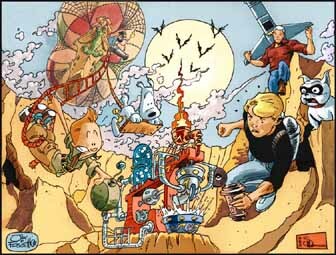 Todd writes: Like most genre enthusiasts of my generation, Classic Jonny Quest is just a part of our basic education, and I'm a big fan. This piece was created as a friend's gift for Christmas, 2011. My attempt was to try something different than a standard group shot. I was always fascinated with the Quest hovercraft, so I included that in the drawing. 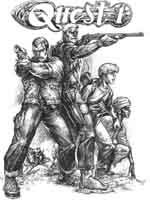 Because my memory was sketchy on the details, I was fortunate that scans of the original designs were featured here on classicjq.com. 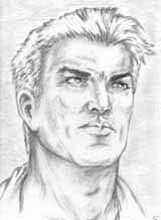 Todd Fox has been drawing comics since 1989, and has worked for such publishers as Marvel (drawing Wolverine and The Punisher), Image, Now Comics and Eclipse. Todd accepts commission requests, and can be reached via AymGeronimo.com, where you can see his current comics project, Aym Geronimo and the PostModern Pioneers. Here's one I thought you'd like. My friend and colleague Eric Clark is learning how to paint digitally and decided to do a practice piece based on my Robot Spy doodle. Feel free to display it. The piece was all done digitally, using The GIMP, at 5.963 in x 4.640 in. and 600 dpi. 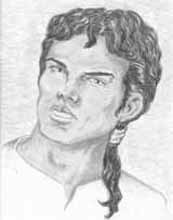 Madeleine's blog, which has more of her art, is at http://mfisherart.blogspot.com/. Click on the thumbnail to see a larger version of the image. These are Susan's vision of our heroes (from the "Real Adventures" time-frame) as they might appear if they were "real persons" who sat for a portrait sketch. Click on the thumbnails to see a larger image. Submitted by Erin Morris, who wrote initially to say: I have a really detailed commission in progress from two very talented artists (one a huge JQ fan). It's a JQ/Tintin crossover. We think this is cool, too, and offer this link to the wikipedia entry for Tintin for those who want to learn more about the comic strip and the artist, HergÃ©. Neil wrote: I am a student at NSCAD University in Nova Scotia majoring in print making. I made this piece for an art show held at the school gallery last semester. The title of the piece is: "Race" Bannon. It is made up out of stencils and spray paint. It is on a canvas that is 3'X3'. Below is my artist statement that was printed in the book handed out to people who came to the opening. 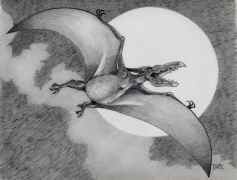 Pteranodon in the Sky! Business Casual Apparel! Ready for action! On an ambiguous background and setting. White. These are four out of seven of the themes in my painting " 'Race' Bannon". 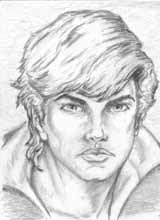 The other three include attractiveness, 'Race' Bannon and miscellaneous theme. 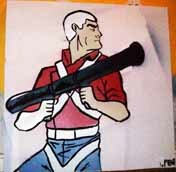 'Race' Bannon can be seen in his khakis and red shirt frequently as depicted on my art square. He also can be spotted on occasion sporting beach party wear, khakis on the beach and of course suede vests. What an Action! What a Bazooka! What a man! 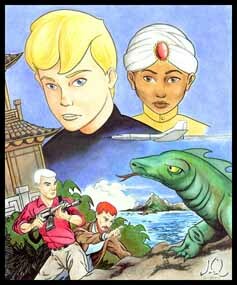 I'm a huge fan of the original Jonny Quest series, and I idolize the original Race. I did this piece because I feel like Race isn't anything people want him to be. He certainly is not the man depicted in the second series, or any other cameos he has had on Cartoon Network shows (Harvey Birdman and the Venture Bros.). I have many of my fifth graders going to your website to both look at the goodies (including their teacher's drawing and other items) and use the wallpaper for their computers. The fifth grade has a reward activity for the well-behaved students called "extravangaza" at the end of every six weeks. I offer a choice called "Jonny-Quest class" and I had over thirty students in my last extravaganza on my last day with the students in mid-December. Some of my students asked their parents for the DVD set for Christmas! 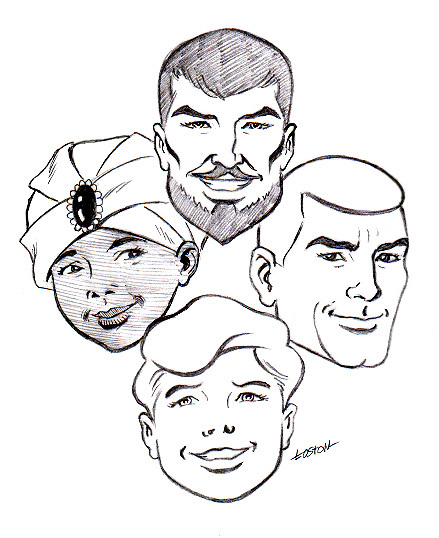 Thanks much, Rich, for your efforts to keep Jonny Quest in the minds of your students; we think if more people followed the ideals of Jonny, Hadji, Dr. Quest and Race today, the world would be a better place. Click on the link above to see artwork from Rich and his students. Even though created by a professional artist, these images still qualify as "fan art" -- extremely high-quality fan art! Kent Steine - artist, illustrator. See his bio here. [This sketch originated as] a "dumb" play on Quetong Missle Mystery and Race saying "Looks like we'll have to take care of this one the hard way". That's really all it started as. A kind of joke. Also, Race is not an easy character to draw on-model. "Our" Race anyway. So It was as much a study in trying to capture not only his facial features, but his physique, posture and other physical mannerisms. 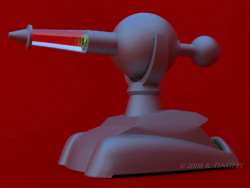 While learning a new 3D application (Modo), I decided to build the Para Power Ray for fun as my first 'tutorial' model. 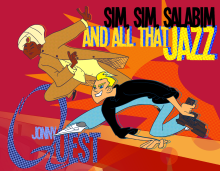 Though it could use quite a bit of additional work to improve it, I need to focus on other priorities instead - thus I'm submitting this 'final' image to the Classic Jonny Quest community for their enjoyment. Frank Dietz - a former Disney Animation artist and award-winning "Classic Monster Artist"
Jonny Quest was my favorite show as a child, and remains one of my all-time favorite television series. I recently did this interpretation of "Turu The Terrible," just for fun. I thought you guys might enjoy it. I'm planning on a few more interpretive JQ characters. Can't wait to do "The Invisible Monster" in watercolor! Media: pencil, 8.5 x 11 inches. I did the head sketches in about 10 minutes. I drew it on simple 8 1/2" X 11" copy/typing paper with a 2-h pencil. Not much more to tell other than I did the characters from memory (and therefore must apologize if some of the details aren't correct). When time permits, I hope to do a pen and ink action sketch for the site--full body shots this time (heh), and also Bandit! I have been a fan of Doug Wildey for years. 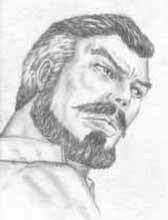 I own one of Wildey's Sgt. Rock pages, and I actively seek out and collect back issues of his work from Black Hawk to Rio. The Movie Cowboy Book, a collection of Wildey's western pin-ups is one of my most prized possessions, in a studio filled with artistic treasues. I proudly display the complete JQ resin statues set in on a top shelf within this sanctuary of fandom. Here is a colorized version of the image above. Loston writes: I started to play around in Photoshop today and did a decent "quick and dirty" coloring job on the piece. And here is another version that includes Bandit. Media: 14 x 17 inches; pastels and pencils -- with ink as an afterthought. This Quest-themed montage was done as a commission for another fan. 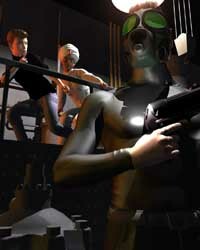 "Quest image 1" © Daniel Scott Gabriel Murray, 2003. "Quest image 2" © Daniel Scott Gabriel Murray, 2003. Click on the images or titles to see larger versions. Contact Daniel and see more of his work at the All Night Light and Power Company. © 1999, David McAdoo. Media: pencil, 18 x 24 inches. As far as background on the piece, it was done just last year, '99, and there wasn't any particular episode in mind, I was really just trying to capture the essence of the original series in a more modern and realistic style. The "Quest 1" logo was added last minute as part of the modernization of the piece. I put it in to kind of give it a new-look logo. At the time I started it I had been trying to visualize what actors the studios would get if they made a live action, big budget movie of the classic Quest show. This started the creative juices flowing and I thought it would be cool to see everyone realistically. I like my work but nothing can beat that '60's style of comic art. I have always drawn Jonny and the gang, usually in my own style and usually as realistic as I can, and I have quite a few at this point but I wouldn't say that it's a series. Although that's a cool idea I might toy with in the future. Lance writes: It's a piece I did on MS Paint (the most primitive drawing program in existance!) while on break during a computer class I took last year. It's my first ever digital piece of art and I did it without the benefit of reference over a a trio of 15 minute periods! I'm going to learn Lightwave in the coming year and you may see an animating, photo real version of this very thing in 2001. One can hope, Lance! Click on the image or title to see a larger version. Jonny and Hadji enjoying a moment (water color) ...inspired from a shot in "Arctic Splashdown" when Jonny and Hadji were laughing at Bandit's antics. Bandit is not afraid of monsters (water color) ...based on a scene in "The Invisible Monster" when Jonny and Hadji pretend to be a monster to help Bandit get over his fear. 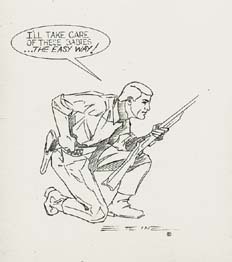 John reportedly sketched this based on the famous Doug Wildey 1986 poster image -- and he did it in about 30 seconds! John is Gary Karpinski's uncle, and is a professional artist and art instructor. Marc Hempel - artist for the Comico Jonny Quest comic books. Technically, this is still "fan art" - even though it was done by a professional artist who worked on a JQ project. This fun picture from the "Amazing Heroes Swimsuit Edition" publication features the Jonny Quest cast, with Bandit tugging on Jade's swim suit ala the Coppertone Tanning lotion ad.